Items presumed to be the data recorders from the crashed Malaysian plane have been found and delivered to Donetsk, eastern Ukraine, according to the leader of the self-proclaimed People’s Republic of Donetsk. 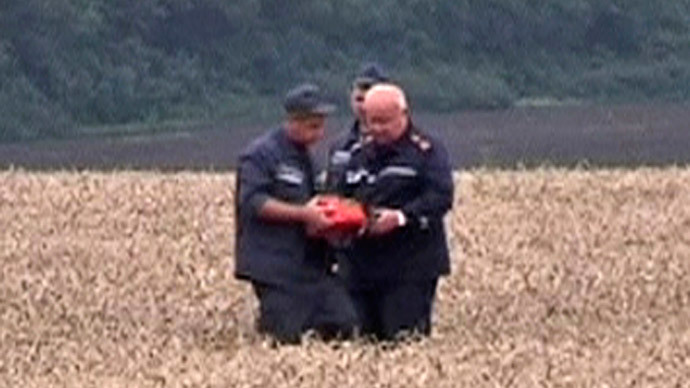 “Aircraft parts looking like black boxes were found at the site of the plane crash. They are currently in Donetsk, in the People’s Republic’s (DPR) government headquarters, under my personal control,” Aleksandr Boroday, the republic’s prime minister, told reporters. The self-defense forces are ready to hand the data recorders over to international monitors “in case they arrive,” he said. Another official for the DPR, Sergey Kavtaradze, said that what he thought were the flight recorders looked undamaged on the outside. He added that since there are no aviation experts in the DPR, they cannot be absolutely sure that the found items are the black boxes. 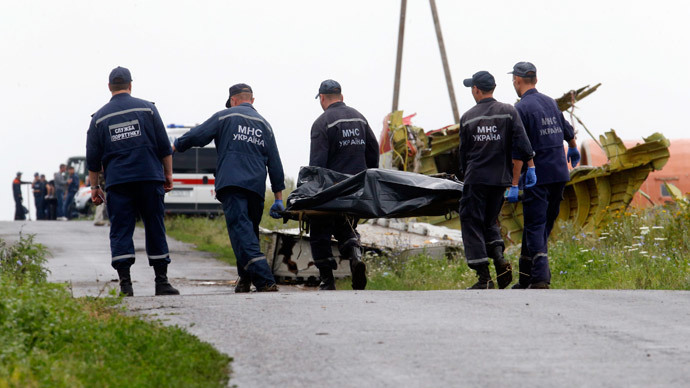 The items will be passed to the International Civil Aviation Organization (ICAO) which will lead the investigation into the crash of flight MH17. Ukrainian Deputy Prime Minister Vladimir Groysman said that Kiev had suspected that the boxes were in rebels’ hands for several days, Reuters cited. A group of international experts has yet to arrive at the site of the tragedy. They are expected to be in the region on Sunday evening, according to DPR’s Deputy Prime Minister Andrey Purgin. “A huge crowd of experts are sitting in Kiev for some reason and. They will probably come here only on Sunday,” Purgin told Russian News Service on Saturday. Earlier, the DPR said it would guarantee the safety of specialists investigating the plane crash in the area if Kiev agrees to a ceasefire. 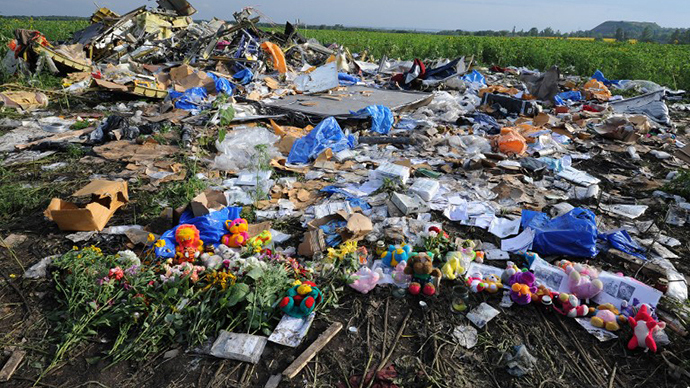 Meanwhile, monitors from the Organization for Security and Cooperation in Europe, OSCE, observed Sunday a train with bodies of the plane MH17 crash victims which are to be sent to Donetsk. Refrigerated train cars were kept on a railway station in the town of Torez, not far from the crash site. 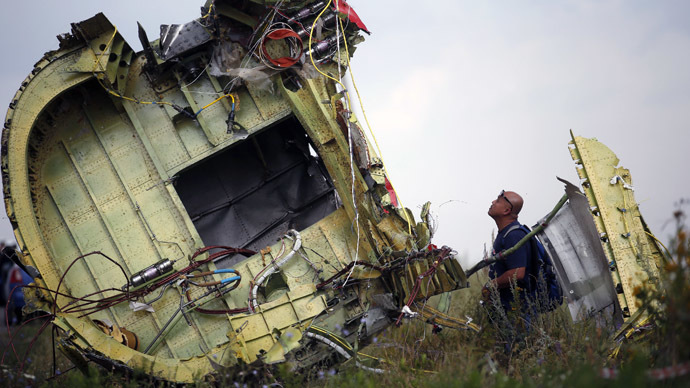 So far, 223 bodies of passengers killed in the Boeing 777 crash on July 17 have been recovered. The Malaysia Airlines plane was en route from Amsterdam to Kuala Lumpur with 298 people on board, including 15 crew members. The search operation in the conflict-torn east Ukrainian region is continuing.